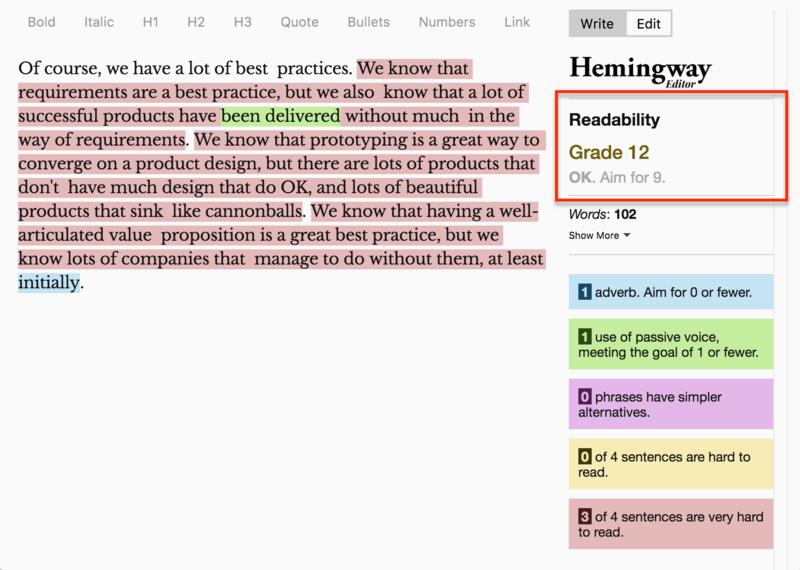 In my Writing Tips for Product Managers post I suggested making your writing more readable. I mentioned a tool I use called Hemingway. It has both a Mac app and an online version. I’ll start with a paragraph from a blog post I wrote in 2013. It’s not a bad post! But it was before I discovered the importance of readability. 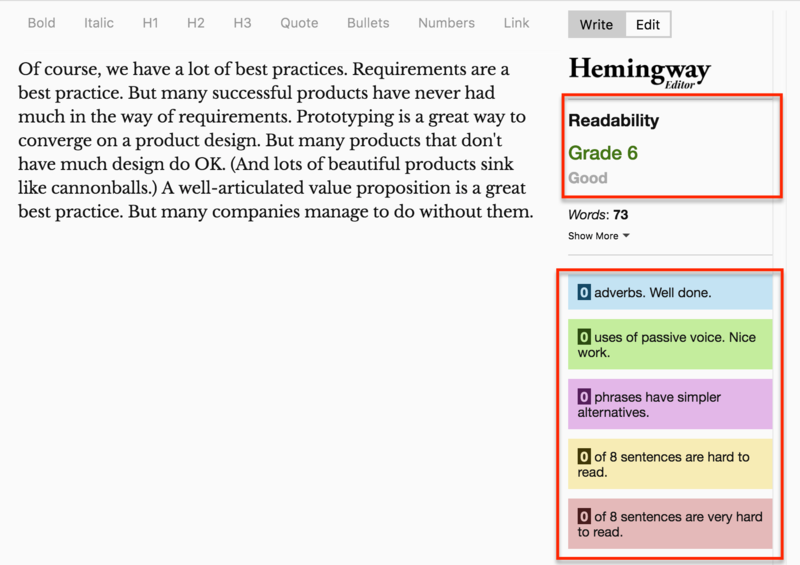 In 2015 started using sites like readability-score.com to help me improve my writing’s readability. And then I got Hemingway, which is much more convenient. Hemingway says this paragraph is Grade 12. And its remark is “OK. Aim for 9.” Its assessment of the writing is on the right. I did avoid passive voice and adverbs in the original. But Hemingway deems three sentences “very hard to read.” What makes a sentence hard to read? Length is one criterion. Shorter is better. Length of the words in the sentence also contributes. You can see that I love to make long sentences. I often put a thought into a sentence, and then expand on the thought. And this can lead to very long sentences. It’s a habit I’m trying to break. Hemingway is helping me. The first thing I do is to shorten some of my sentences a little bit. A natural place to shorten a sentence is at a comma. For example, in the original we had this very long sentence. It has 28 words! I shorten it by putting a period in at the first comma. I take off the “We know that…” fragment. It doesn’t add much. Then I rewrite the second clause a bit. As two sentences, the meaning is the same – perhaps even enhanced. And the grade level has dropped to 9. After fixing the first “very hard to read” sentence. After I make the same transformation on all the long sentences, I end up with this. Reading level 6. Two-thirds as many words. No passive voice. No adverbs. Here are the original and the updated paragraphs side by side. The new paragraph now has a grade level of 5. Of course, we have a lot of best practices. We know that requirements are a best practice, but we also know that a lot of successful products have been delivered without much in the way of requirements. We know that prototyping is a great way to converge on a product design, but there are lots of products that don't have much design that do OK, and lots of beautiful products that sink like cannonballs. We know that having a well-articulated value proposition is a great best practice, but we know lots of companies that manage to do without them, at least initially. Of course, we have a lot of best practices. Requirements are a best practice. But many successful products have never had much in the way of requirements. Prototyping is a great way to converge on a product design. But many products that don't have much design do OK. (And lots of beautiful products sink like cannonballs.) A well-articulated value proposition is a great best practice. But many companies manage to do without them. 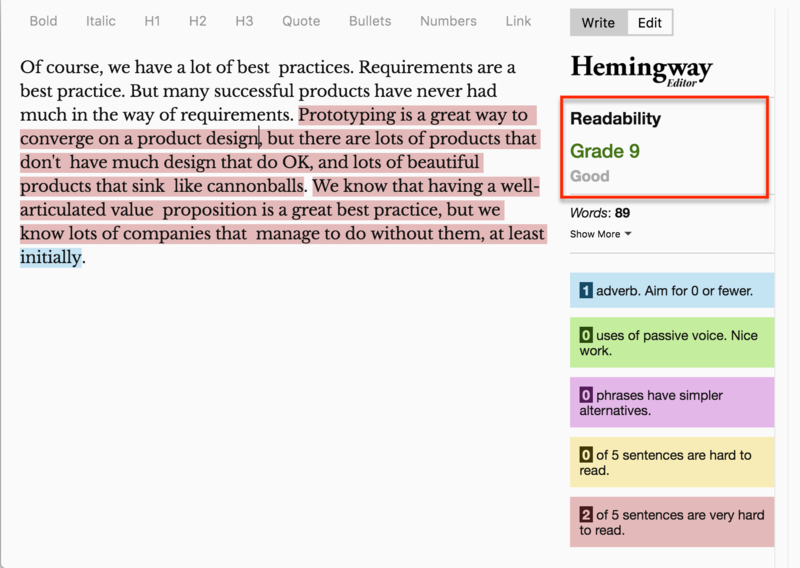 Improving the readability of your writing is definitely worthwhile! I have found visitors are much more likely to read my blog posts when they are easy to read. Even if your readers are highly educated, they prefer easier-to-read writing.